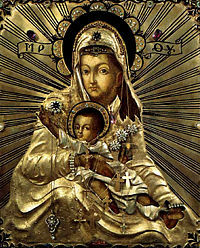 In opposing the teaching of Nestorius, the Council of Ephesus formalized the idea of the Virgin Mary as theotokos—Mother of God. For the council of 449, see Second Council of Ephesus. The Council of Ephesus, also known as the Third Ecumenical Council, was a gathering of leaders of the Christian churches in the Roman Empire to deal with the Nestorian controversy. It was held over several sessions in 431 at the Church of Mary in Ephesus, Asia Minor (modern Turkey). The council was called after Patriarch Cyril of Alexandria appealed to Pope Celestine I to condemn Patriarch Nestorius of Constantinople for heresy due to Nestorius' refusal to use the term theotokos (Mother of God) in relation to the Virgin Mary. Thinking to defend himself from the charge, Nestorius convinced the Emperor Theodosius II to hold an empire-wide council to resolve the matter. In addition to its theological dimensions, the Council of Ephesus is often viewed as a manifestation of the longstanding power struggle between the Christian schools of Egypt (Cyril) and Syria (Nestorius), as well as between the authority of Rome and Constantinople. The composition of the council was heavily disputed due to Cyril's opening of it without a major delegation of Syrian bishops being present who would have supported Nestorius. As a result, Patriarch John of Antioch soon held a competing council which condemned Cyril and his supporters. The proceedings were conducted in a heated atmosphere of confrontation and recriminations. Although Cyril's council was ultimately accepted by the emperor and confirmed by the pope, its pronouncements resulted in the Nestorian schism and the separation of the Assyrian Church of the East from the Eastern Orthodox Church. The council is accepted as ecumenical by Oriental Orthodox, Eastern Orthodox, Roman Catholic, and a number of later Western Christian groups, including some Protestants. The council also condemned Pelagianism, a doctrine which denied that the original sin had changed human nature and held that humans were capable of moral perfection. Fifteenth-century map showing Ephesus, in the Ionia region on western coast of today's Turkey. Nestorius was a Syrian churchman and pupil of Theodore of Mopsuestia who came to be appointed to the key position of patriarch of Constantinople by Emperor Theodosius II. Nestorius emphasized the true humanity as well as the divinity of Jesus by insisting that Mary, the mother of Jesus gave birth to Christ, not God himself. He thus used the term christotokos (Christ-bearer) for Mary rather than theotokos. He further insisted that only Christ, not God, died on the Cross. Cyril and his supporters objected to making such distinctions between the divine and human natures of Jesus. After Nestorius' appointment as patriarch of Constantinople, Cyril wrote to Pope Celestine I accusing Nestorius of heresy. At a Roman synod in 430, Celestine became convinced that Nestorius' views were indeed not orthodox. The pope replied to Cyril on August 11, giving him authority to write to Nestorius and warn him that, unless he recanted within ten days of receiving the ultimatum, he was to consider himself excommunicated and deposed. The document was served on Nestorius in late November or early December. However, Nestorius was evidently well informed of Cyril's and Celestine's actions and had already acted to forestall them. He persuaded the eastern emperor, Theodosius II, to summon a general church council to judge the matter. In taking this action, the emperor did not appear to be supporting Nestorius against Cyril, for such a synod had also been urged by influential monks of Constantinople, whom Nestorius had excommunicated. The pope did not object to the council and sent three representatives to the meeting. Theodosius, perhaps naively, warned the council, under Cyril's presidency, to maintain impartiality. Nestorius arrived at Ephesus with a mere 16 bishops, while Cyril came with 50. From the beginning, contention arose when Nestorius invited all those assembled to join in prayer at Vespers, but Cyril's party refused to attend. Bishop Memnon of Ephesus, a supporter of Cyril, had 40 bishops present in addition to 12 from Pamphylia. Others came from Jerusalem, Philippi, and Thessalonica. However, the contingent from Syrian Antioch, who were generally allies of Nestorius, had been delayed. More than 60 bishops made a written request to Cyril, begging that, in fairness, the council should be delayed until the arrival of the Antiochan contingent. Count Candidian, the emperor's representative, took the same view. 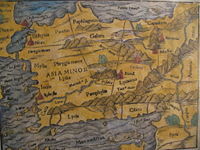 Cyril, however, held the majority and determined to open the council with or without the delegation from Antioch. 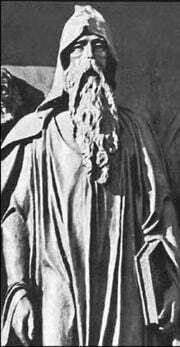 Cyril also determined that since Nestorius had not recanted within the ten days fixed by the pope, he should be treated as being excommunicated. Unknown to all present, the pope had actually replied to a query from Cyril declaring that he intended for Nestorius to be given a hearing at the council. Neither his letter nor his delegates, however, had arrived yet. The council assembled on June 22, 431, with Cyril as president. Nestorius had been invited to attend but did not choose to do, sensing that he was badly outnumbered. Now officially summoned, he still did not comply, and his supporters also boycotted the meeting, viewing the opening of the council before the arrival of the Antiochan bishops as a flagrant injustice. "Since... the most impious Nestorius has neither been willing to obey our citation, nor to receive the most holy and god-fearing bishops whom we sent to him, we have necessarily betaken ourselves to the examination of his impieties; and, having apprehended... that his opinions and teachings are impious, we... with many tears have arrived at the following grievous sentence against him: Our Lord, Jesus Christ, Who has been blasphemed by him, has defined by this holy synod that the same Nestorius is excluded from all episcopal dignity and from every assembly of bishops." This sentence received 198 signatures, and some more were added later. A brief notification of the sentence was sent to Nestorius, referring to him as "the new Judas." The whole business had been concluded in a single long session. Count Candidian, however, had the notices of the deposition torn down and silenced the cries in the streets against Nestorius, which had been mobilized by Bishop Memnon. The council wrote at once to the emperor and the clergy of Constantinople. Nestorius, for his part, also wrote a letter to the emperor, co-signed by ten bishops, complaining of Cyril's convening the council without the Antiochenes and of Memnon's alleged use of threats and violence. Five days after the first session, John of Antioch arrived in Ephesus and immediately opened a rival council with the support of Count Candidian, who was convinced that Cyril had acted against the wishes of the emperor in convening the council before John's arrival. John confirmed Nestorius' accusations of violence perpetrated by Memnon and his supporters. He also accused Cyril himself of various heresies for failing to distinguish adequately between Jesus' human and divine natures, an accusation which would later be leveled against the Monophysites, many of who cited the teachings of Cyril as their authority. John's council was attended by 43 bishops. It deposed both Cyril and Memnon. However it stated that it was willing to forgive those who had cooperated with Cyril if they agreed now to condemn him. Both parties sent a report to Rome, while in Constantinople the emperor was much distressed at the division. He wrote that a collective session must be now be held, and the matter begun afresh. Documents and statements Nicene Creed confirmed, condemnations of heresies, declaration of "Theotokos"
It is doubtful to none, nay it has been known to all ages, that holy and blessed Peter, the prince and head of the Apostles, the pillar of the Faith, the foundation of the Catholic Church, received from our Lord Jesus Christ, the Savior and Redeemer of the human race, the keys of the Kingdom, and that to him was given the power of binding and loosing sins, who until this day and for ever lives and judges in his successors. His successor in order and his representative, our holy and most blessed Pope Celestine. The synod, with only a few staunch supporters of Nestorius holding out, then sent a new letter to Emperor Theodosius confirming its sentence as truly ecumenical and urging the emperor to dismiss the bishops and allow them to return to their homes. It further urged that a new bishop must be appointed for Constantinople to replace Nestorius. On July 16 a new session was held, in which Cyril and Memnon presented charges against John of Antioch for his role in hosting the rival synod of late June. The next day a fifth session cited John for accusing Cyril and his followers of the Apollinarian heresy and also excommunicated him, together with 34 bishops of his party. The synod described itself as now consisting of 210 bishops. A long letter to Celestine I gave a full account of the council, and mentioned that the pope's decrees against the Pelagians had also been read and confirmed. The sixth session of the council declared that anyone who should propose any doctrines beyond those of the current and previous ecumenical councils should be deposed if a bishop or cleric, or anathematized if a layman. In the seventh and last session, on or about July 31, the bishops of Cyprus persuaded the council to approve their claim of having been exempt from the jurisdiction of Antioch. Six additional canons were also passed against the adherents and supporters of Nestorius. The emperor had always championed Nestorius, but had been somewhat shaken by the reports of the council. There followed after this a number of intrigues by which both parties tried to get the emperor on their side. Eventually the emperor arrived at the extraordinary and logically implausible decision that he should ratify the depositions decreed by both councils. He therefore declared that Cyril of Alexandria, Memnon of Ephesus, and John of Antioch were all deposed along with Nestorius and his followers. Memnon and Cyril were kept in close confinement. However, the representatives of the council and the papal legate Philip eventually persuaded the emperor to accept only the larger council under Cyril of Alexandria as the true one. Nestorius, seeing the writing on the wall, anticipated his fate by requesting permission to retire to his former monastery. The synod was finally dissolved about the beginning of October, and Cyril arrived triumphant at Alexandria on October 30. Celestine I was now dead, but his successor, Sixtus III, confirmed the council's decisions. The Council of Ephesus by no means ended the christological issues it had addressed. In opposing Nestorius, Cyril of Alexandria and some of his supporters had characterized the unity of Christ's divine and human natures in such a way as to blur the distinctions between them. This doctrine later became known as Monophysitism. It insisted that there was only one nature in Christ, which was a unity of divinity and humanity. This idea would eventually be condemned as equally erroneous, if opposite, to Nestorianism. The Council of Chalcedon (451) settled the matter, for the time being, by insisting on "two natures," but "without confusion, change, division, or separation." Cyril worked hard to remove Nestorius and his supporters from power, in the Syriac-speaking world, Nestorius' teacher Theodore of Mopsuestia was held in very high esteem, and the condemnation of his pupil Nestorius was not received well. Consequently, Nestorius' followers were given refuge in what is today Iran and Iraq. Some of them even found their way to India and China. Modern churches can be found in all of these lands which trace their roots to Nestorian times. Today's Assyrian Church of the East never denounced Nestorius as a heretic, although it rejects the label of "Nestorian." History of "Council of Ephesus"
This page was last modified on 11 December 2017, at 20:55.